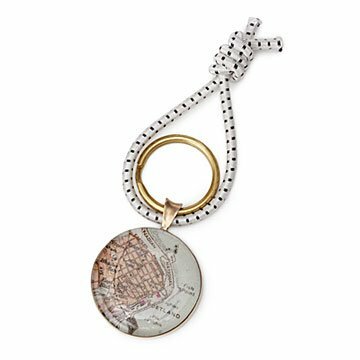 Carry your keys on this ring that preserves a map clipping of your cherished locale of choice. Home Is Where the Chart Is. No matter how many miles away you are, you can always carry a memento that's spot on. Take your favorite locale on the road with you with this handsome travel companion that preserves the memory of your most cherished sites while keeping your keys organized and accessible. Customized to the coordinates of your choosing, each map or chart swatch is immortalized in resin and mounted in bronze. International locations are available, but maps may be less detailed. Handmade by Charlotte Guptill in Maine. Add extra personalization with a custom message engraved on the back of your key ring (up to 25 characters). It's a durable keychain that is unique. I love this!! Very unusual piece for a memorable event, I had it made for an undergrad graduation and had the map of the Grad school campus and surrounding area, love the engraving! It came in a beautiful gift box! Beautifully done! Could not be happier!! This is the best anniversary present ever! I wanted something practical and unusual to commemorate our anniversary. This was absolutely the perfect gift. He loved it as it! This was a gift for my husband, our 21st wedding anniversary. I had the address of our wedding reception as this location became one of our favorite special occasion spots. This gift far surpassed my expectations, it is simply beautiful! I can't wait to give it to my wonderful husband. I would work with this artist again! Totally awesome! A wonderful customized gift! The artist perfectly captured the message I was after - our first date. I purchased this as an anniversary gift for my husband. I picked a map of the beach where we were married. Usually, he's not one for key ring bling but he really loved the map. I enjoyed how easy it was to customize! I sent in the address, I was sent a proof, I asked for one tweak and they nailed it! This is such a fun item.